Please find attached some photographs taken on 23rd February in Mumbai. By making division of darkness according to your own wishes, you will not find there even a spark of light. Help us unveil the secrets of Gnani Purush Param Pujya Shri Kanudadaji! Submit your essay to jssyouth for the 2nd Annual JSSY Essay Contest! Explore the non-doership aspect of Gnani Purush–how He observes the world, His oneness with Nature, His responsibility to mankind. 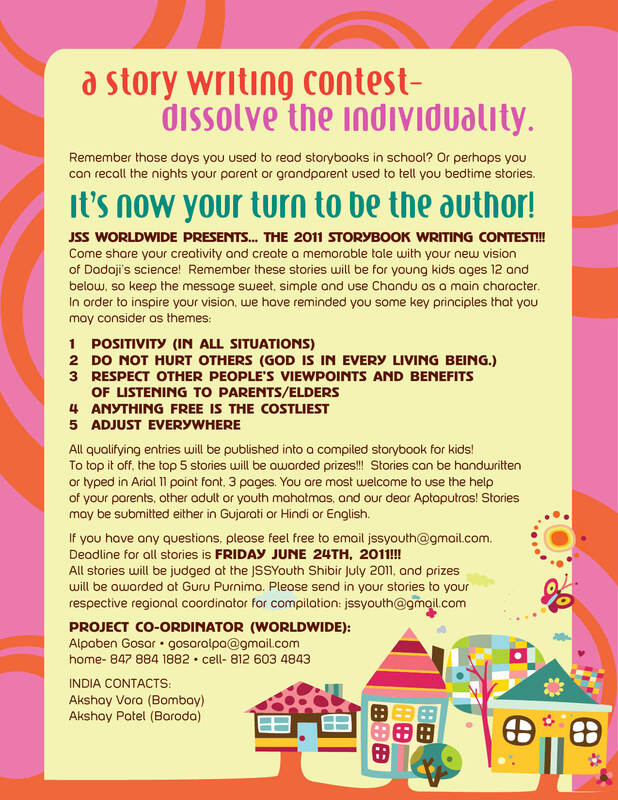 Next–Help us tell the story to our next generation–write a story and submit it to jssyouth for the 2011 Storybook Writing Contest! For more information regarding essay and storybook contests–please find the attached information in PDF format. Check out the latest pictures of Kanudadaji in Mumbai! Pragat Gyani Purush no sanjog ye divaya hoya che. Te malva muskel che. Temanu mukat hasaya joine jagat bhooli javatu hoya che. Aa ek ajayabi kahevaya. Aa scope uttam kahevaya. The effects will appropriately follow the same pattern as that of the causes committed earlier. Right attitude to the circumstances is within your domain. Check out the latest pictures of Kanudadaji @ Kelanpur! Dada ne photograph ma jota lagase ke temani health ketali sari che. Pan khare khar sari che ane teni saathe mahatama ni temani mateni bhavana kaam kari rahi che. Mate dadaji mate hamesha prathana karajo ke temani health kayam mate sari rahe ne aapane kaam lage. I am glad to inform you that Dadaji has showered His Blessings to all of our JSS Youth for their continued efforts to progress and explore Jagat Kalyan… Swa-Kalyan in which the world would naturally get benefited by showing them as Living Examples of His Teachings where our individuality would get dissolved and ONLY "Dada" would gets projected… "As it is!!" We need to show to the world that we are UNITED in divisive circumstances of today, which is a very important aspect of HOLISTIC VISION so that atleast at our heart we remain united through this Science of Holism.